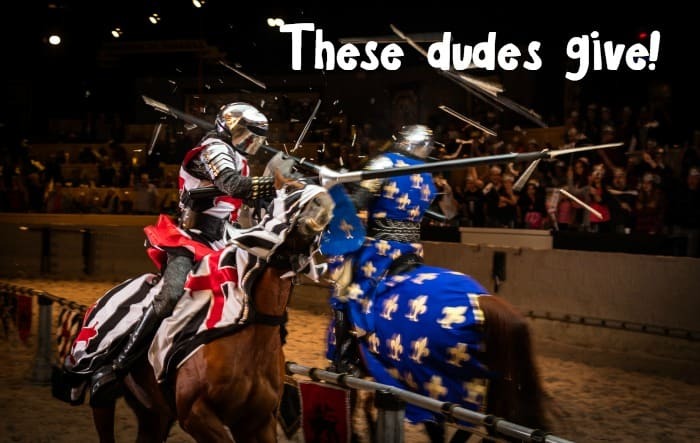 Special thanks to Medieval Times for sponsoring this post and making it possible for me to connect with my teen son through giving with Medieval Times Toy Drive. There’s not much that rattles me. I’m a pretty laid-back kind of gal, but there’s one thing that REALLY gets me–my teen son. And I feel like a large part of our “problem” (meaning mostly why I get upset at him over his negative behavior) is that we’re not really bonded on very many levels. Because we adopted him, I’m sure we’re missing a big chunk of that bonding we would have gotten when he was a baby, but I can’t go back and get that time. So I had to find new ways to build our relationship, and this holiday season, I’m knocking-off these 5 Ways to Connect with Your Teen Son Through Giving. It’s going to be so much fun. Like an advent calendar–but less tasty. Heh. Food Drive. Almost all schools and churches are run food drives around the holidays. Work with your son to select canned goods from your pantry, or even the store, to carry to one of these drives (together–this is about TOGETHER). Ask him “what do you think they’ll make with this…” or “do you think they’d like…”. Ask his opinion. Gift-Buying. Instead of you buying gifts for everyone for Christmas, have your teen son come with you to the store and work together to select gifts. Don’t exclude him and ask his opinion and recommendations. This really works. Toy Drive. 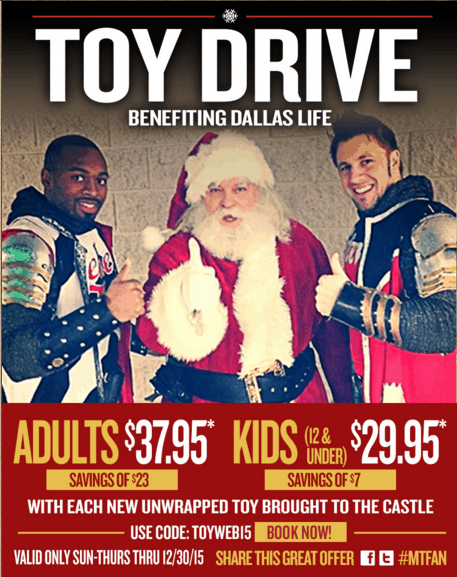 We’re planning on participating in the Medieval Times Toy Drive Benefiting Dallas Life. I’ve always wanted to take my son there for a night of tourney and turkey and this makes a great excuse. Go with your son pick out the toy and deliver it to the drive together. One gift that you pick together. Angel Tree. I am a big believer in the angel tree. We do this every year. We pick a boy from the tree that’s about his age or younger (at his choice) and we go together to get the gifts. It’s a tradition and he’s brought it up more than once that it’s his “favorite part” of Christmas shopping. Donating Clothes. Teen boys grow CONSTANTLY. It’s ridiculous. They never, ever stop. So, they have a ton of clothes in their closet that don’t fit anymore. Great excuse to work together to find quality items that your son can donate. Have him fold them up and carry them to the car, go with you and take them to Goodwill. Together. Always together. You’ll notice there’s a key word here: together. There’s pretty much nothing that you can do alone and bond with someone, which is what I think really happens to teen boys and their parents. The boys are growing-up and capable of doing things alone, so they go their own way–and parents let them. So, I’m not. I’m going to give WITH my son. Totally easy plan, right? Check out the cool offer below that we’re taking advantage of to give WITH Medieval Times. Hope we see you there! *Discount is valid off full-priced adult and kids admissions only. Must present a new unwrapped toy for each admission. Limit 6 discounted admissions. Cannot be combined with any other discounts, group rate or voucher tickets. Upgrades are additional. Discount must be mentioned at the time of booking and is not applicable on past reservations. Valid only at the Dallas castle. Must mention or enter code TOYWEB15 at time of purchase. Only valid Sun-Thurs thru 12/30/15. Click here to learn more about this offer.